We believe training should drive results (and a measurable ROI) – and we believe coaching matters more. Gallop’s recent research claims that only two out of ten sales managers may have the talent to fully succeed as a coach. Two more have some of the talent and 60% have none of the talent. Gallop also reports that if you can support those with coaching talent and those with some coaching talent to fully perform to their abilities, together they will contribute about 48% greater profits than the remaining 60% with no coaching talent. Clearly, this mean training for the coach delivers a very high ROI. Gallop’s bottom line is that the sales performance of any sales team is a direct reflection of how the team is coached. Most research indicates that 90% of sales training has no lasting impact after 120 days for some very specific reasons. Training can be a disappointment right away when it doesn’t go well, or it can be a disappointment when the promised results don’t materialize. When sales training fails it is usually for common reasons. Even if sellers leave training with increased skills, they often don’t know what to do to get the best results. Sales process, measurement and coaching must dovetail well with training. Banks should adopt a consistent method of selling in order to raise performance across the board. Coaching with scorecards that includes quarterly action planning creates a cadence of expectations, accountability and feedback to sustain the training and drive ‘breakthrough results’! Most training is a multi-day event in which sellers learn and practice new skills. Without the reinforcement of sales process, measurement systems, scorecards and coaching, most will forget what they learned, how inspired they were in the classroom, and they will return to old behaviors. Few banks actually evaluate the effectiveness of the sales training and sales performance in general. Without quantitative evaluation metrics in scorecards, it’s nearly impossible to hold sellers accountable for changing and improving behavior, or for taking actions and achieving results. We agree with Gallop’s research – your sales performance will be a direct reflection of how your sales teams are coached. In a recent client survey we found that business bankers receiving great coaching reach on average 112% of goal, in contrast to business bankers reporting poor coaching who achieve only 78% of goal. We believe coaching matters more! Coaching is the keystone of your entire sales culture. 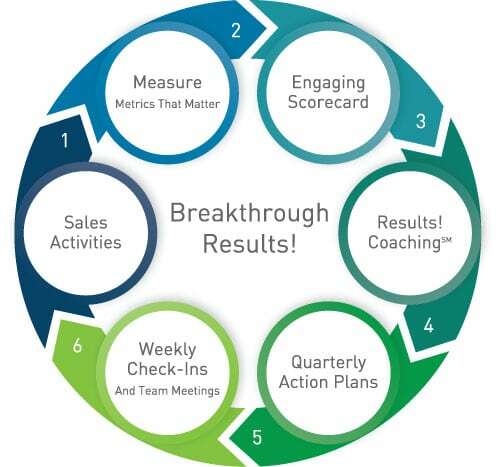 Performance Insights’ nationally recognized training for the coach (Managing Breakthrough Results) is a continuous cycle of process, measurement, scorecards and coaching. It is based on Ron Buck’s Six Breakthrough Behaviors of High Performers which defines the disciplines of sales execution.